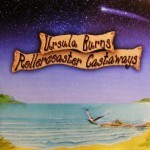 ROLLERCOASTER CASTAWAY – Ursula Burns has never been your orthodox singer. She is a conjurer of ethereal mood and other worldly mysticism that has yes a nod towards Donegal’s Enya but with more in common with Tom Waits in her unpredictable phrasing and use of instruments. From the lynchpin of Burns’ meandering piano flourishes producer Keiran Kennedy has added fascinating musical ideas and a guest appearance by Hothouse Flowers’ Liam O’Maonlai on the opening Keep It In Your Heart. If you are up for the challenge and long for the envelope to be pushed then look no further. Drifting By, the vocally inventive Melting With The Sun and Nowhere To Go are particularly fulfilling. 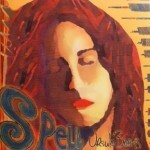 SPELL is written and performed on the piano. Ursula’s writing and style defy categorisation. Instrumentally her work is in the folk idiom yet her lyricism falls more readily into a surreal and imaginative vein, musical and tuneful with dark undertones, an incredible eclectic mix of styles held together by a distinctive vocal… The album shows the development of an artist who is etching deeper into her music. The transition between her first album and this body of work shows a constantly evolving and versatile talent, which will make her CD a necessary addition to anyone’s collection. From the Albert Hall to the back bars in Belfast (and a few tube stations along the way), from the fire escape of burning buildings and even the police station in the Red Light district of Amsterdam. Finally Ursula moved to a haunted farmhouse in Ballyweird, Portaferry, to write her second album.After many years and a few thousand miles walking with a horse drawn Theatre Company, ”Horse and Bamboo”, she decided to come back home and face the music by writing songs. 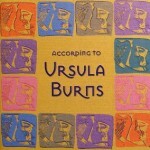 Her first release SINISTER NIPS, and album, ACCORDING TO URSULA BURNS were written on the harp. Her experience as a stage actress was undoubtedly an advantage in presenting and performing her repertoire. Ursulas live performance shows extraordinary confidence and her originality and exuberance caught the imagination of viewers and media alike.